Johnny Yungut Tjupurrula, born circa 1930 in country northeast of Kiwirrkurra, is the last surviving man of his generation. 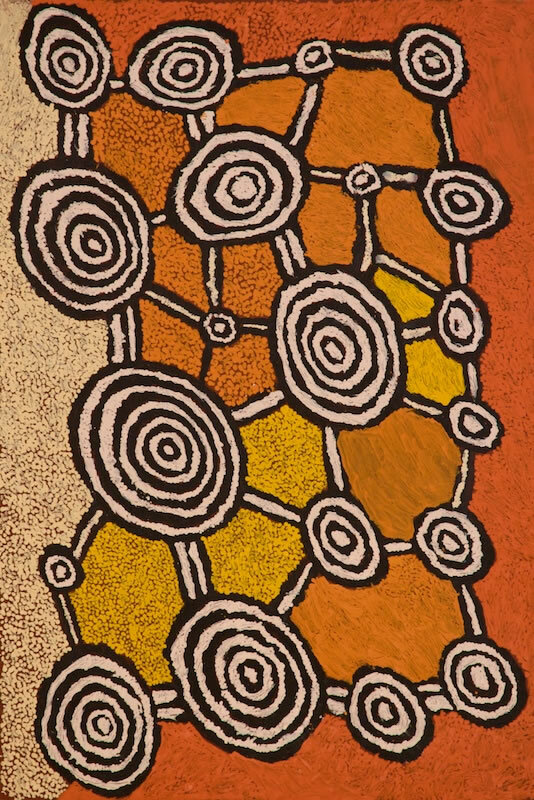 He first started painting for Papunya Tula Artists in 1978, however he moved away from Papunya and only resumed painting for the company at Kiwirrkurra in 1991. 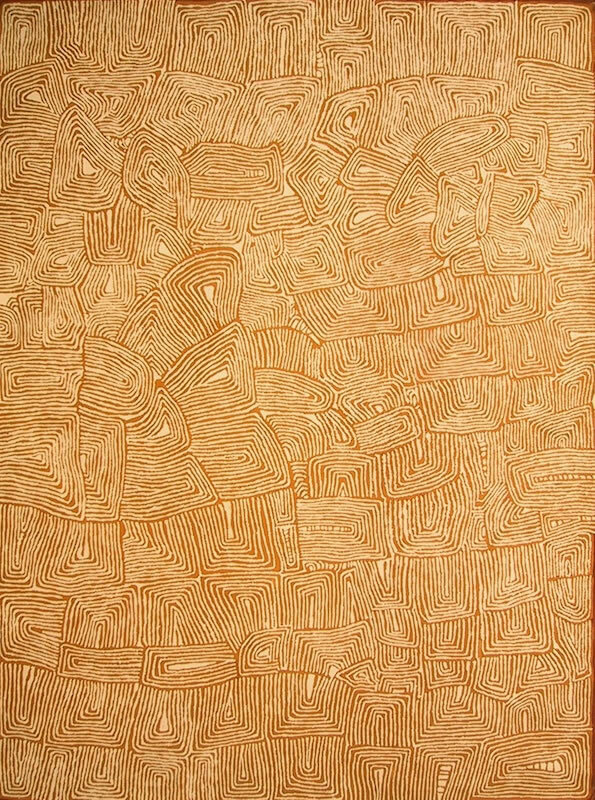 Johnny Yungut has had three solo exhibitions, the most recent in 2013 at the Papunya Tula Artists Gallery in Alice Springs. 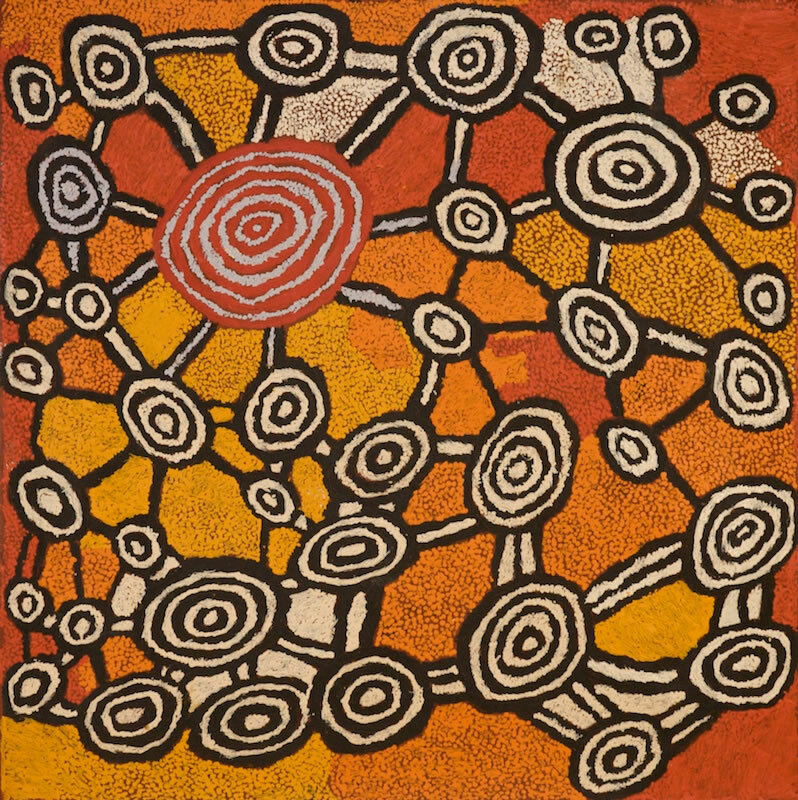 His work is in the collections of the Aboriginal Art Museum, the Netherlands, Griffith University, the National Gallery of Victoria and the Seattle Art Museum, USA. “A fascinating aspect of Tjupurrula’s unique painting style is that he uses one of two opposing palettes. 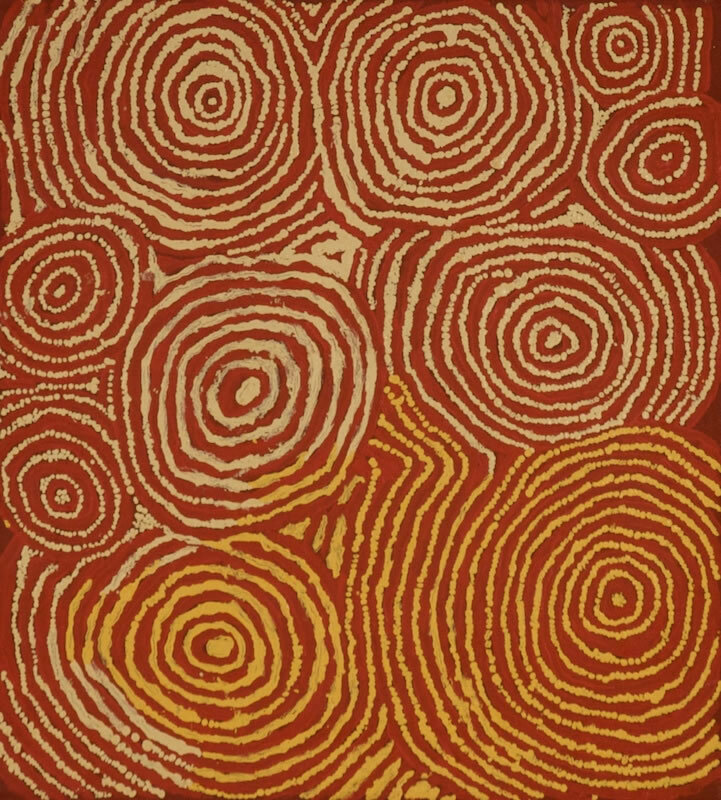 Each painting begins along a primed red ground where the tracks of ancestral men’s journeys are outlined in solid black brushstrokes. It is at this point that his paintings take on one of two distinctly different tonal ranges. Vivid orange, red and yellow outcroppings are nestled amongst bold shapes of purple and white. His brushstrokes are meticulous, dabbing and dragging the paint, he works the paint into shapes that are at once ordered and chaotic. In complete contrast he creates works using soft muted white, yellow, pink and purple. 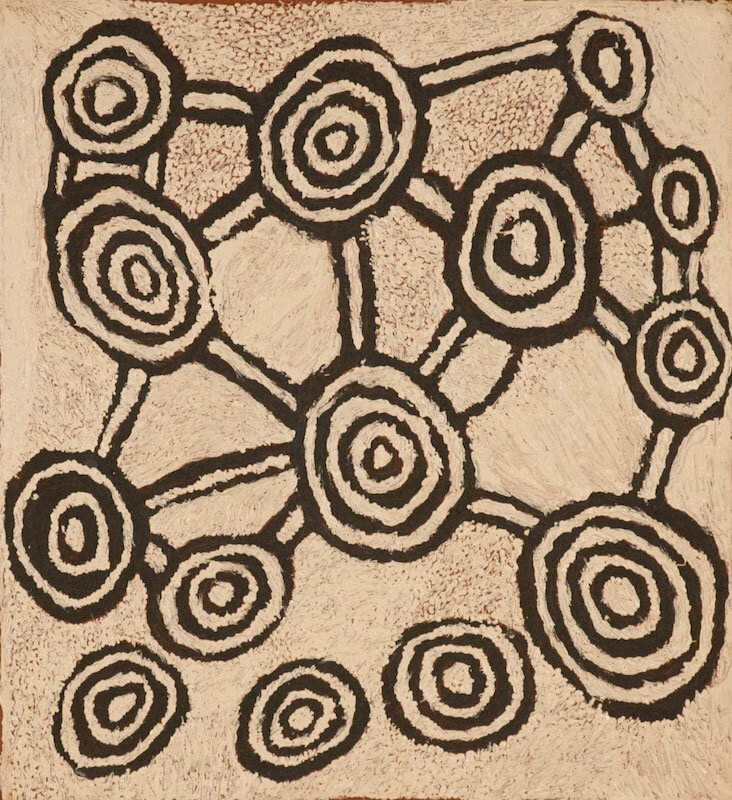 By delicately scratching fine elusive marks, he painstakingly works up larger expanses of ground.” (Nici Cumpston, Curator, Aboriginal and Torres Strait Islander Art, Art Gallery of South Australia, 2013).